Used to join electrical/electronic wires and Copper fittings, heating panels, high voltage components & sound equipment. 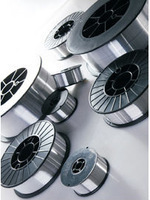 Used in spray wire form to spray molds, patterns, capacitors, trophies, and for ultrasonic soldering. Paras - 91%Sn - 9%Zn - 390°F (199°C) eutectic alloy is the best solder for Aluminum wire to Copper busses or Copper wire to Aluminum busses or contacts. Its low eutectic melting point minimizes heating of critical electrical/electronic parts. Paras - 85%Sn - 15%Zn – has a wider plastic range of 390°F - 500°F (199°C - 260°C). This makes it ideal for hand soldering Aluminum plates and parts, allowing manipulation of the parts as the solder cools. The following chart represents Paras standard Tin-Zinc alloys. Many factors, such as materials, temperature, and method of application determine the solder joint strength and characteristics. Call for engineering assistance to discuss your specific needs. We recommend testing appropriate alloys in your specific application to ensure suitability. We are an registered supplier of B.H.E.L , N.T.P.C, DEFENCE, INDIAN RAILWAYS , RDSO , WESTERN RAILWAY, SOUTHERN RAILWAY ETC.. Started in the year of 1970, we Paras Enterprises is a leading organization of this field dedicatedly, engaged in manufacturing and supplying a best array of Brazing Alloys and Fluxes. This range is manufactured by us using high grade quality raw material given by the repudiated vendors of the market. In this quality approved collection of products. We are offering Silver Brazing Alloys, Copper Brazing Alloys and Brazing Fluxes. These products are widely appreciated across the market for their optimum performance, sturdy construction and error free functional life. To meet the ever-changing needs of our customer base. We are offering these brazing alloys and fluxes in varied stipulations. Since our starting in this area, we are backed by a team of talented professionals and top notch infrastructure facility. We have installed all the latest machines required for the manufacturing of offered brazing alloys and fluxes. We have chosen highly experienced team members to execute our business operations smoothly. Apart from this, we are able to deliver the bulk requirements of the offered products in correctly and timely manner.